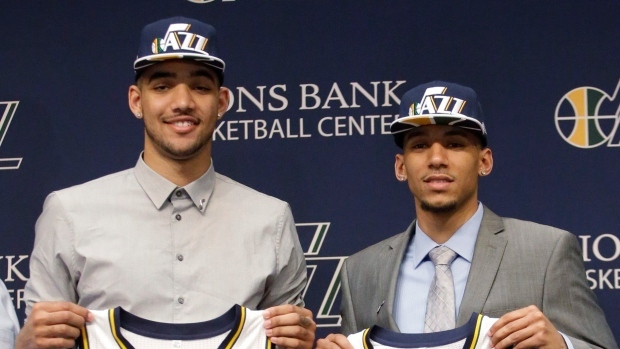 SALT LAKE CITY - The last 48 hours have been all about the draft picks for the Utah Jazz as the team introduced former Kentucky forward Trey Lyles and Boston College Olivier Hanlan during a Friday news conference. The future of the organization and its immediate playoff hopes, however, are all about those already under contract. The draft is an optimistic time of adding young players who teams hope will be significant contributors in the future. That's especially true for lottery teams that missed the playoffs and normally need immediate help. The Jazz have a different scenario. They had the sixth-best winning percentage after the All-Star break and missed the playoffs, something they want to change. Lyles and Hanlan aren't likely to provide that push as rookies. Free agency is on the horizon, but the biggest strides the Jazz will make must come from players already on the roster. "All of our guys have got to get better from A to Z if we want to get where the prize is at," general manager Dennis Lindsey said. "There's no reason that can't happen. ... We're going to have to shoot the ball better, but there's no reason that can't happen with the people we have. "Hopefully the players being more intimately involved with (coach) Quin (Snyder) and the coaches during the off-season, (they) will have a greater grasp of what's going on. ... It's a pretty dynamic, neat learning environment. And that's the kind of atmosphere and culture we're looking to build and further expand." Lyles and Hanlan were the stars Friday. There's optimism in Lyles' versatile game and the length from his 6-foot-10, 241-pound frame. He filled a role at Kentucky, but Snyder described his game as "subtle" and the team believes he'll be able to add a consistent corner 3-point shot eventually. Hanlan carried a heavy load at Boston College and led the Atlantic Coast Conference in points per game. The native Canadian showed off his French-speaking skills, but the Jazz hope his basketball skills will blossom with more room to work in the NBA from spacing and not being at the top of opponents' scouting report. But the Jazz are more concerned with the development of last year's rookies Dante Exum and Rodney Hood. Rudy Gobert needs to continue to improve on the offensive end. Alec Burks needs to be healthy. "The thing about where we're at, if someone really unique wants to say yes (in free agency), we're in position to capitalize on that," Lindsey said. "If not, we have a very young, talented team that we expect to be much better next year. "Our best free agent is Alec Burks. It's like he's a new addition. We're very excited that his progression with his shoulder injury has gone without any hiccups. ... It's almost like he needs to be reintroduced to Quin and the coaches system." Snyder said Exum has been working on his balance and attacking the defence. Hood is developing a post game. Gobert has added 2 inches to his standing reach, in part, from improved posture. Those three, Derrick Favours, Trevor Booker, Chris Johnson, Grant Jerrett, Jack Cooley and Ian Clark have all spent time at the Jazz facility this summer. The team has attempted to create an environment that encourages players to work with coaches instead of hiring their own personal trainers. The entire thought process goes back to player development, knowing a superstar free agent is unlikely to walk through the door. This corps must continue to grow for the playoffs to become a reality. "My focus now has gone much more to our individual guys and their development," Snyder said. "We've put into place some very specific and detailed player development plans for guys to follow. "It varies for each guy. ... You lose, in grouping guys, or having the same workouts for everybody, you're neglecting that they're individual players."